Confectionery Queen: Wedding Cake Project 2: Orange and Ivory Fondant Cupcakes. 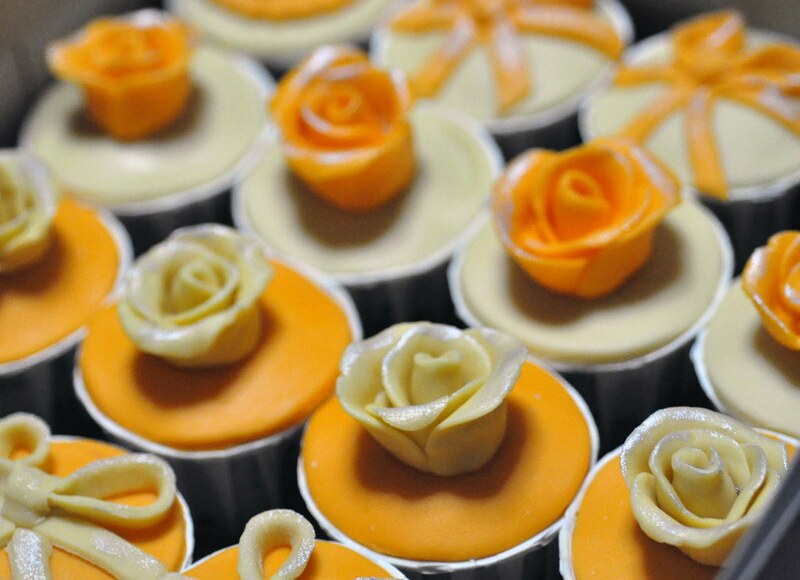 Wedding Cake Project 2: Orange and Ivory Fondant Cupcakes. These are chocolate cupcakes with chocolate buttercream frosting, covered with orange and ivory fondant at the top. 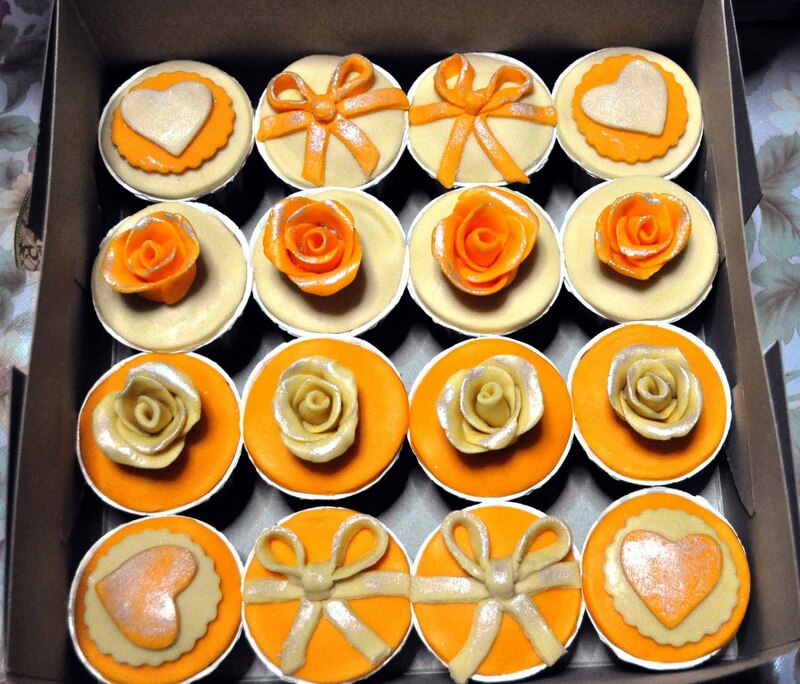 A friend of mine ordered these cupcakes as a wedding gift (gubahan hantaran) for her groom. I spent almost the whole day yesterday making these, and my back still hasn't recovered from the strain of sitting up straight for long hours while trying my best to decorate the cupcakes as prettily as possible. And.. i don't know why the heck it took me so long to decorate 16 cupcakes only?? Gosh, i work at a speed of a freakin' snail. To be honest, i'm not satisfied with the design of the cupcakes. I wish i could do better than this. You can tell from the picture that i ran out of ideas for the design and hastily rubbed silver glitters all over the fondant to make them look less dull. Fail. When i delivered these cupcakes to my friend, i was so darn nervous to show her my work, afraid that she might suddenly turn into a huge bridezilla and start throwing the cupcakes to my face, or eat me alive or something. But thank god that she's so easily pleased! The second i opened the lid of the box, she started jumping up and down, hugging me, complimenting how pretty the cupcakes were and contemplating to keep these cupcakes to herself and scoff them down on her bed when midnight strikes. But she discarded the idea in the end. Seems like her love for the groom is bigger than her love for cupcakes. Gasp! Rejecting cupcakes over a man??? Is she even human??? So all is well in the end. I'm really happy to see that my customer is happy with my work. But i know that i have to keep on practicing on the design.